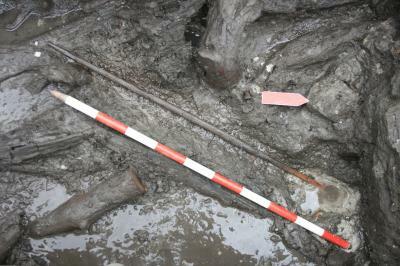 One of the oldest preserved bows of Europe and, so far, the oldest one found in a Neolithic context, has been unearthed in the lacustrine site of La Draga (Banyoles, Catalonia). The bow is made of yew wood (an all-time favorite material for archery) and measures 108 cm and is dated to c. 7400-7200 years ago from context, being among the earliest dates for Neolithic in Western Europe. Older bows are known in Europe, specifically Denmark, but are from the Epipaleolithic period, some 9000 years ago. What could be arrow points are known from c. 64,000 years ago in South Africa. Source: The Archaeology News Network. 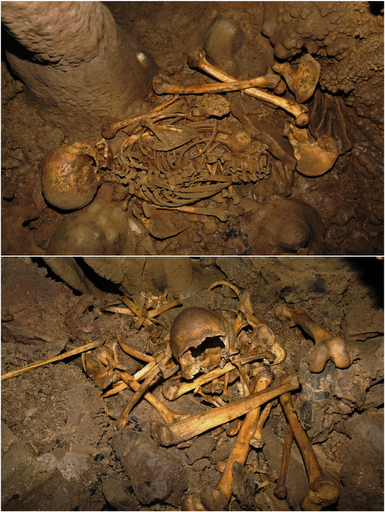 In this case two individuals (right) from La Braña-Arintero site in Valdelugueros (León province near the Asturian border), dated to 7000 years ago, borderline with Neolithic arrival but, according to the paper, still “Mesolithic” (i.e. Epipaleolithic). 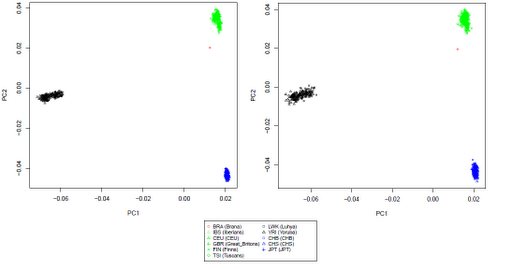 Federico Sánchez Quinto et al., Genomic Affinities of Two 7,000-Year-Old Iberian Hunter-Gatherers. Current Biology 2012. Pay per view. The two individuals carried haplogroup U5b2c1 (I guess that they were relatives, maybe siblings). The mtDNA sequence was retrieved in full. M. Lacan found mtDNA H among Epipaleolithic Basques in 2011. M. Hervella found mtDNA H and U5 among pre-Neolithic Cantabrians and Basques respectively a couple of months ago. Previously, conference materials by Chandler, Sykes and Zilhao (2005) and by Kéfi (also 2005) had reported lots of likely mtDNA H and, less commonly, U5 and other lineages, in Epiplaeolithic Portugal and Late Upper Paleolithic (Oranian) Northern Morocco (Taforalt cave) respectively. Other studies in Upper Paleolithic Andalusia are also consistent with the presence of both main European grand lineages in the Iberian peninsula since Solutrean (U5 plus what?) and Magdalenian times (H with great likelihood). As we can see the dimension 1 is hijacked by the Tuscan-Finnish duality, while the dimension 2 seems almost private, extending inside all populations with minor variations. 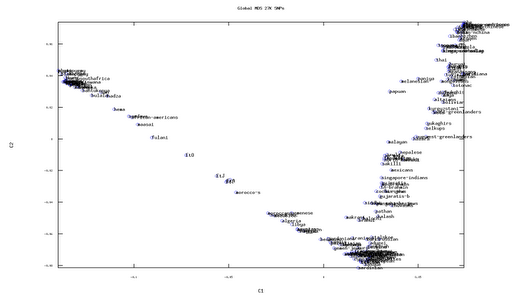 This render the PCA essentially useless and meaningless. However it would seem that the La Braña individuals cluster best with some British and some of their creole cousins from Utah (CEU). Interestingly the La Braña individuals not just cluster separately from Modern Europeans but they actually look “more Asian” than these. 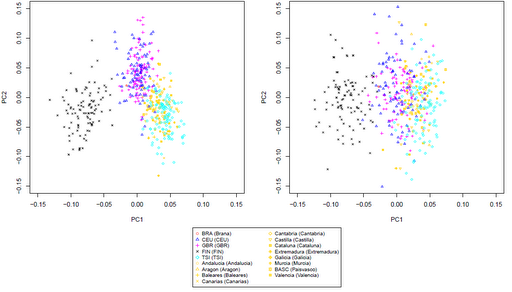 In fact, would we superimpose these PCA plots on any global one with more samples (which always takes an L shape with vortex at or near the European cluster) like this one (from Etyo Helix), the La Braña people would overlap Afghans and Gujaratis, roughly. So it’s like the analysis performed is more perplexing than informative. Not really helpful. We can only hope that the sequences are soon released to the public domain so independent researchers can perform contrasting analysis. These PCAs alone are almost useless. The cave was only excavated since 2006. Braña 1 was found in flexed position with ochre and a delimitation of the niche by rocks (but there is evidence that no earth was disposed on top of it). Braña 2 was found in non-anatomical disposal (possibly because of post burial alterations by water or people), at the bottom of a natural hole 4 m. deep, just beside the other one and with indications of being also a primary burial. Braña 1 had no caries but erosion of some teeth in what is suggested to have been caused by the use of teeth tool. There is a serious injury in the upper jaw by piercing artifact (spear? ), which healed. Associated to Braña 2, there were found 24 perforated deer canines, possibly part of a necklace or other decoration originally. Julio Vidal et al., LOS HOMBRES MESOLÍTICOS DE LA BRAÑA-ARINTERO(VALDELUGUEROS, LEÓN): UN HALLAZGO FUNERARIO EXCEPCIONALEN LA VERTIENTE MERIDIONAL DE LA CORDILLERA CANTÁBRICA. 2008. ··> found at Academia.edu. Julio Vidal et al., LOS HOMBRES MESOLÍTICOS DE LA BRAÑA-ARINTERO (VALDELUGUEROS, LEÓN): EL HALLAZGO, SITUACIÓN, ASPECTOS ARQUEO-ANTROPOLÓGICOS, CRONOLOGÍA Y CONTEXTO CULTURAL ··> found at Academia.edu. Even if I do not often see eye-to-eye with Dienekes, he is the one providing the first known independent analysis of the La Braña people. He has done so in two successive updates of the entry on these interesting, yet perplexing, sequences. As you may know, he uses two main sets of zombie components (deduced from his own analysis, sometimes a bit questionably but well…), which he calls K7 and K12. They are Eurocentric in concept, what is convenient for this purpose. K7 has three West Eurasian components that he labels West Asian, Southern and Atlantic-Baltic. Where Atlantic-Baltic is the main European component, being strongest towards the West and the North, the top population being Lithuanians and the 50% isocline going through the Tyrrhenian Sea, the Northern Appenines, the Greek-Bulgarian border and the ethnic border between Russians and others in the North Caucasus. In other words: Europeans are generally high in this component, with very few exceptions, all them Mediterranean or Caucasian. After removal of these likely Neolithic-arrival components and apportioning, the “reformed” Portuguese sample would end up being 96% Atlantic-Baltic and 4% African, what leads me to think that some extra Atlantic-Baltic may also have arrived with the Neolithic-specific components, assuming that the La Braña pre-Neolithic substrate can be extrapolated to Portugal (what may be but is not necessarily the case). Basically the Atlantic-Baltic has split in two European subcomponents and the African one in two as well (with a tiny 3 points displacement from the European to the African components as these become more refined). Remember that they are zombies (pre-determined components) and not the product of any direct comparison with actual populations. However for this purpose it is probably the best thing to do initially. For reference the Atlantic-Mediterranean component is highest in SW Europe (Basques and Sardinians notably), while the North European is highest in NE Europe, in spite of the misleading name (former USSR, Finland). British (or the CEU HapMap sample or the Irish) are almost half-and-half for both components, just like the La Braña people, what explains why they cluster best with them… if we ignore the African part. Like the La Braña people, British also have c. 10% “other stuff”, in their case it is however the “Gedrosia” component, strongest in Pakistan and Caucasus and which is suspected to be informative of Indoeuropean (Kurgan) ancestry (along with uncertain amounts of the Northeastern, “North European”, component). But the big mystery is the East African component, which is distinct from the North West African (Moorish or Berber) one, which we might all have expected on first look. This East African component is highest among the Sandawe (68%), Somali (69%), Ethiopians (55%) and that’s about it. North Africans have some but not at all at such levels and certainly not without the NW African or other components absent in the La Braña pair. This is extremely hard to explain because modern Portuguese’s African component is nearly all NW African (7.7%), with some minor Sub-Saharan (0.7%) and nearly no East African (0.1%). So the illusion maybe generated at K7 of these people’s genomes being explainable by means of revising modern Iberians… seems to collapse. So the results remain perplexing (I have received criticisms for using this and similar words but that’s the truth and if you look online, nobody seems to have good answers – it’s not just me). But the results are still informative. Regardless of whatever the East African component means (what obviously demands further analysis), it seems obvious now that both European-specific components (North European and Atlantic-Med in Dienekes’ slang) are pre-Neolithic. 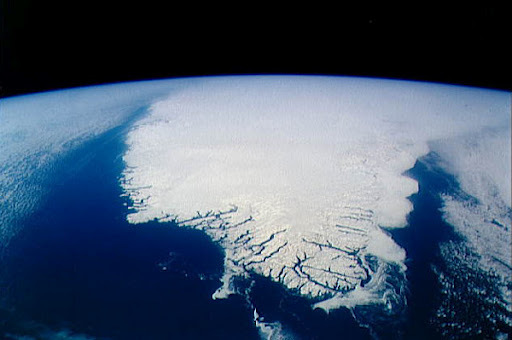 And that is important because it opposes the most common and simplistic Neolithic replacement models. It would seem that, whatever the intra-European genetic shaking and re-scattering and the arrival of minority genetic components from the Neolithic onwards (mostly from West Asia), the bulk of European ancestry is Paleolithic European after all. Dienekes is even providing us with a nice visual comparison (right), using his K12 zombies, of five prehistoric Europeans. Notice that the two so-called hunter-gatherers from Götland (an island off Sweden) are actually Neolithic hunter-gatherers at the best and Neolithic mixed-economy people most likely. They belong to the Pitted Ware culture, which is derived from the Neolithic of Ukraine and nearby parts of Russia: the Dniepr-Don culture. Derived from this, eventually some people with characteristic pottery, possibly some domestic animals such as pigs, but a largely gatherer economy (hunt and fish) spread towards the Baltic and in some cases crossed it towards Sweden. That would explain their high levels of NE European (aka North European) component. The South (or rather SW) Swedish farmer belonged instead to the Megalithic phenomenon and the Funnelbeaker (TRB) culture of Denmark and nearby areas. His affinities are mostly Sardo-Basque (Atlantic-Med), with a bit of Neolithic and NE European elements. The North Italian farmer (or rather Alpine pastoralist) is the famous Ötzi “the iceman”. His affinities are also Sardo-Basque (to a lesser extent than the Nordic farmer) and also has a good deal of West Asian affinities (Caucasus and SW Asian) and even some North African affinities. Finally the Northwes Spanish hunter-gatherer is a combo of both La Braña genomes (very similar and quite incomplete), whose meaning (in my opinion always) I have discussed in the previous update section, a few lines above. The latest zombie comparison (different set of zombies) by Dienekes (scroll for updates in the already provided link) is similar to the previous (i.e. c. 90% like modern Europeans, specifically NW ones without the “Neolithic” stuff) but instead of being anomalous towards Africa it is towards East Asia. Not sure what to think other than it seems to point to some unchartered component with deep roots. Nevertheless, he details that there are some peculiarities making it unique: like the kind of necklace found along individual number 2 and very specially the characteristic of the funerary space: corpses deposited on the floor of a selected hypogeum. “From another point of view, La Braña-Arintero provides another evidence of the spectacular increase in the number of burials in the 7th millennium a.C. and that may relfect an intensification of the territoriality in these societies”. Pablo Arias precises that the more striking characteristic of the funerary context of La Braña-Arintero resides in the sepulchral space itself, detailing that it is an exclusively funerary site, with no link to settlements of that age. We see that a remote cavity, apparently not suited for habitation, and the corpses have been placed there in peculiar spaces, well delimited by natural space in the way of niches. And this, as he defends in the article, is a funerary behavior that has no clear precedents in other peninsular contexts and rather reminds to behaviors more common in later periods instead. And… what we just needed, so to say: Bushman affinities! In his latest comparison, using the DIY Harappa World calculator, Dienekes finds that the Braña composite is stubbornly >80% European (in this case 55% NE Euro and 27% Mediterranean) and some 17% (the highest figure so far!) 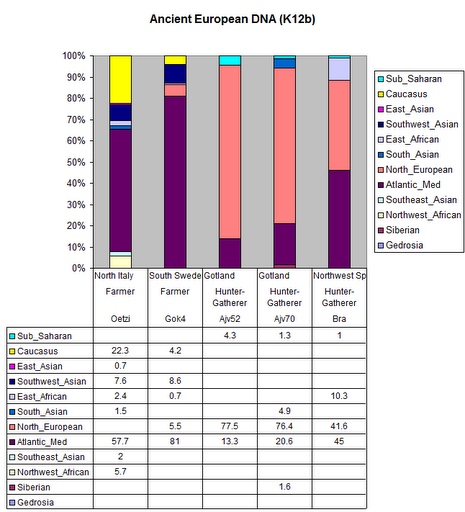 non-European, mostly 7% Siberian and 6% Bushman (San). Another curious snippet: the Castilian forest district of Tierra de Pinares (Land of Pine Forests), located at the border of the provinces of Segovia and Valladolid, happens to be at least 6000 years old, questioning the notion that it was a human creation. Since time immemorial the villages and towns of the area have lived with an economy largely centered on the exploitation of the resources of the pine tree (wood, resin, pine nut), what led many to suspect it was in fact a human design. However a new study of paleosoils has found that the maritime or resin pine (P. pinaster) has been there in large amounts since at least the Neolithic period, some 6000 years ago. The forest is an island of sorts among the wheat and sunflower fields that dominate the Castilian landscape, long ago probably more dedicated to cattle herding however. Cuéllar, above the “sea of pines” (green area behind). The dating, established at the site of Cabezo Juré, Alosno (Huelva province, Andalusia), pushes back the beginnings of soft metallurgy in the area by some 350 years, grosso modo. It is the oldest known metallurgy of Western Europe.